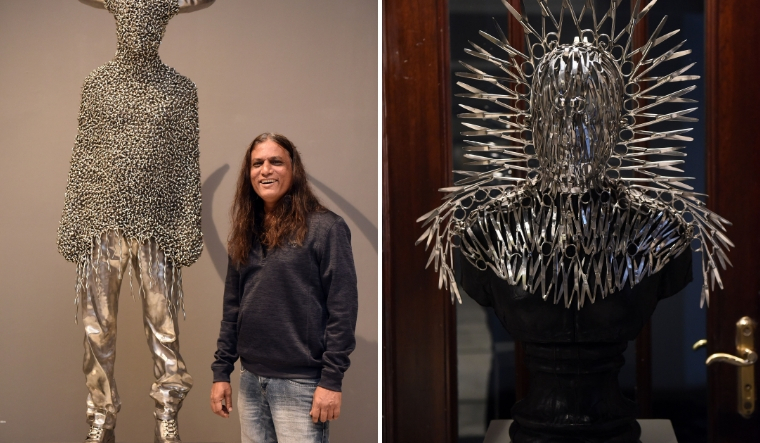 Bangladeshi artist Mahbubur Rahman is a metal-head. In his latest solo exhibition Sounds from Nowhere in Delhi, where he is back after a hiatus of nine years, Rahman presents a deeply moving meditation in metal. There is stainless steel, surgical scissors, gold leaf and iron ink on two-dimensional surfaces. Particularly striking is his "Dislocation" series made this year, rendered in "iron ink" drawing and gold leaf on digital print. They bear a semblance to yellowing, rust-covered stamp paper superimposed with paintings of old human figures plodding on with luggage trunks and family members. It directly references the trauma of partition, uprooting of identity and issues of citizenship. "I wanted to work with metal in a liquid form, in the form of ink. I collected dust from the lead machine and rusted them with water. It has a brownish, golden effect," says Rahman who is at the forefront of multidisciplinary art practice in Bangladesh. He even uses his own body as a medium to seamlessly merge art with activism and to convey his iron-clad commitment to issues that have plagued post-independence Bangladesh, from its post-colonial identity, migration, social stigmas to political censorship and control. Sounds from Nowhere includes painting, charcoal drawings, photography, sculpture and photographic performance art. But the title of the show derives its inspiration from a labour tragedy in 2013 when an eight-storey commercial building Rana Plaza collapsed, killing over 1,100 workers employed by garment factories. Rahman was in touch with people involved in the rescue efforts. One of them found a hacksaw blade used to save a female worker. Rahman was disturbed to see the blade and spent sleepless nights agonising over an appropriate artistic response to the tragedy. What could have been going through the mind of a person tasked to cut a leg in order to give life? "I thought in this case the sound of the hacksaw on human bones should be more rhythmic. It should have a positive connotation. It should be like music in a way; as he cuts a leg, he is saving a life. The hacksaw blade is more like a violin bow," says Rahman who installed a violin in stainless steel with hacksaw blade as a specimen of kinetic sculpture in Burning Violin—as if the blade moves on the string of a violin. Born in 1969 in Dhaka, Rahman studied painting at the Institute of Fine Arts at University of Dhaka. Even as a student there, Rahman was experimenting with site specific work, performance, installation, objects and figures within the confines of a strictly traditional, academic syllabus which did not quite encourage new ideas and modern mediums. He met his wife and partner, Tayeba Begum Lipi, at the University and together they went on create Britto Arts Trust, an alternative artist-run organisation with the aim of connecting Bangladeshi artists with the global art scene with international collaborations and residencies—leading alternative arts practices in Bangladesh. Much more recently, Britto Arts Trusts has shown at the India Art Fair to promote contemporary voices from Bangladesh. Today Rahman, who has also shown his work at the 54th Venice Biennale, is one of the most important cultural activists-artists in Bangladesh. Having closely known recently-released photojournalist Shahidul Alam, Rahman expressed suffocation at Alam being “openly taken away” for voicing anti-government views when the show opened in Delhi on November 29. Lipi and Rahman both work with metals. Lipi has addressed gender violence using razor blades and safety pins in her more intimate sculptural installations of the marital bed, undergarments, bathtub, ironing board and sewing machines. Rahman is more interested in visual commentaries on the larger socio-political realities in his country. In the current solo, there is a profusion of surgical scissors. There is a uniform, cello, human busts and headgears made out of scissors, their blades interlocking into each other in a fine mesh or poking out as menacing reminders. Fascinated with medical equipment and the atmosphere of an operation theatre, he has sought to incorporate these seemingly sterile objects in his sculptures and paintings. "We know the purpose of a material like this is for sharp things, but I transform it into something more aesthetically pleasing," says Rahman who once went to buy his surgical material for a Partition project in India and was surprised to find that Bangladesh imported them from Pakistan. "My political purpose was served when I realised that these scissors were made in Pakistan and came all the way to Bangladesh and I was converting this material into art for India," says Rahman, not without a touch of irony. Blueprint12 is exhibiting Mahbubur Rahman’s solo show "Sounds from Nowhere" which will be on view till December 8 at Bikaner House in Delhi.